REAL LOVE . 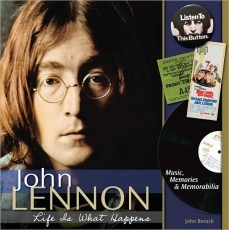 . .
John Lennon -- Life is What Happens celebrates the life and times of one of the most influential musicians in pop music history. A singer, songwriter, artist, social activist, husband and father, Lennon's genius inspired a generation -- and continues to do so today some 30 years after his death. This fascinating read features rare images of Lennon juxtaposed by the myriad pop-culture memorabilia created from the height of Beatlemania into the late 1970s and the Plastic Ono Band. Chronicling his musical career, the book includes hundreds of classic photographs, dozens of quotes by and about Lennon, and personal reminiscences from fans and celebrities recalling Lennon's impact on their lives.